Once upon a time, in the city of London in the quaint little country one might know as England there was a boy. This boy, aged nearly two years, was found on the streets of the city among the refuse. He was taken in by child care. In his possession were the remnants of identification. The only information still intact were the first portion of his name "Derwyn Gwil--" and the last portion of his birth date "--cember 7, 1991." This information correlated with no child in the databases. The young boy was adopted by a couple, Drs. William and Maggie Lockwood. Life went on. Until the good doctors were murdered in a gruesome massacre that took the lives of twenty-three and injured several more. 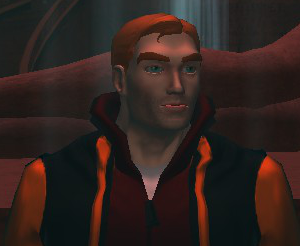 Thusly, our young boy, now five, found himself back in the system he so fortunately escaped a few years before. When he was fourteen, he developed this brilliant plan to escape to the United States. Due to a string of events he unknowing helped along by use of his developing telekinetic powers, he actually made it to Millenium City, Michigan, in the belly of a cargo plane. He was detained by authorities soon after landing with his foster parents flying over soon after. His foster parents, though, were soon murdered, a fate Deri escaped only because of his powers. He fled the hotel and finally lost his pursuer on the streets of Westside, where he's resided ever since. Deri really doesn't care if he's imposing himself on others. In fact sometimes he purposely does so. Deri has a strong rebellious streak. Whether he's rebelling against a particular authority figure or society's expectations, he can be either subtle or blatant and it's hard to predict which route he'll take in either case. Deri can move objects with his mind. Including himself. Deri can construct seemingly solid objects with his mind. He must concentrate to keep these objects intact or else they fade away. He can pull upon Babylon's districts to transform himself. A form develops somewhat like a piece of art. He can't just spontaneously create new forms for himself. 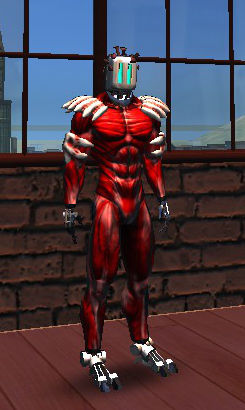 The form of a humanoid without skin, with rudimentary robot-like hands and feet, and a toaster with railroad spikes randomly pounded through it as a head. The form of some sort of faerie-like creature. 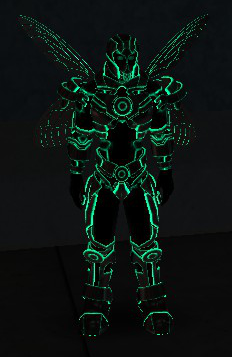 Its armor is a glossy black with a cyan sheen and there are glowing cyan Tron lines highlighting the armor and wings. This page was last modified on 28 July 2016, at 16:19.